The second planned march against agricultural giant Monsanto takes place around the world this weekend. 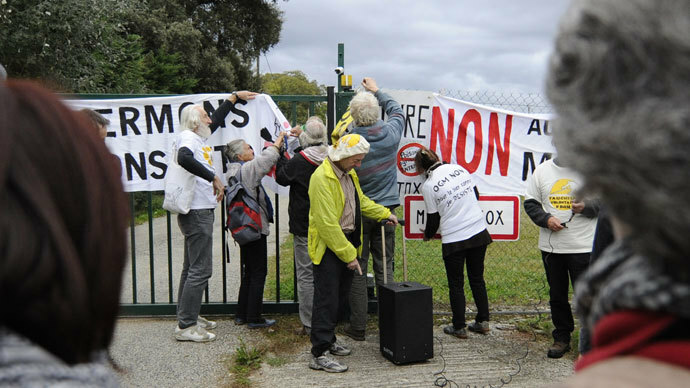 The protesters are rallying against the company’s use of genetically modified organisms and trying to raise awareness about its corporate practices. 12:40 GMT: RT’s Peter Oliver was live in Berlin for the March against Monsanto event, speaking to nutritionist Heidi Osterman and Vice President of the True Food Foundation, Dietrich Wittel. 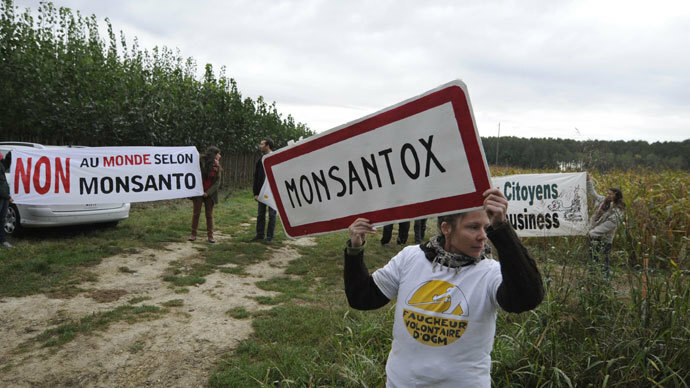 They express a fear that with the coming trade agreement between Europe and North America, Monsanto will never leave Europe. Instead, the laws and rules that apply in America will be protecting Monsanto in European countries as well. 12:15 GMT: You can follow live streaming coverage of the London march against Monsanto by following this link. 12:10 GMT: Citizens of Vienna join the global march. 11:55 GMT: Started as a small event, the first March against Monsanto on May 25 turned into a global campaign with over 2 million people in 436 cities, across 52 countries, joining the rallies. 11:50 GMT: Occupy protesters in Brisbane, Australia with their own anti-corporate messages. 11:20 GMT: Colin O’Neil from the Center for Food Safety told RT about the kind of pressure companies like Monsanto can exert on politicians as they push through laws and patents that work against the farmer. 11:17 GMT: People in locations as remote as the French island of Reunion also host their marches. 10:34 GMT: The atmosphere in San Diego, California, a night before the march was to begin. 09:16 GMT: India’s March Against Monsanto Mumbai has reached Bandra, next stop – Juhu. 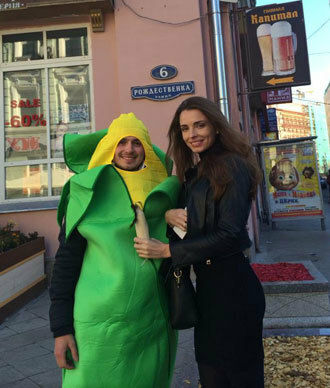 09:00 GMT: A few minutes ago, the Moscow’s own ‘A March With Corn’ got underway, as dozens of activists walked down the city’s central streets passing out ears of corn grown without the use of GMO. The ‘Russia Without GMO’ campaign started in the Spring of 2013, and is expected to collect one million signatures. On September 23, Russia’s Prime Minister Dmitry Medvedev has signed a law that would allow the planting of GMO seeds in Russia, the first of its kind. 08:28 GMT: On October, 5, Movement against Monsanto launched a global ‘Twitter storm’ asking people to tweet and post certain hash-tags as frequently as possible. 08:15 GMT: A total of 52 countries and over 500 cities across six continents are estimated to be participating in the worldwide march against the GMO corporation. 08:10 GMT: The Sydney march is underway, as well as Perth and Adelaide, in Australia. 08:00 GMT: The schedule of worldwide MAM events can be found here. 07:40 GMT: The London march is underway, attended by Dr. Vandana Shiva of the Fortnight of Action for Seed & Food Freedom. Dr. Shiva campaigns for seed sovereignty and freedom of information on food. The London MAM will have her speaking. 07:20 GMT: 404 events for March Against Monsanto have been confirmed worldwide, says GM Watch. VISIT RT.COM HERE for additional updates throughout the weekend.